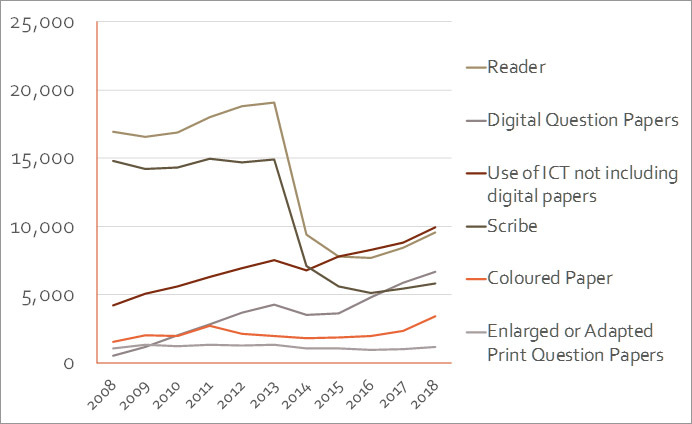 It's 10 years since SQA first introduced Digital Question Papers, and over the decade the number of requests for papers has risen from 514 on behalf of 204 candidates, to 6,662 requests for 2,670 candidates. 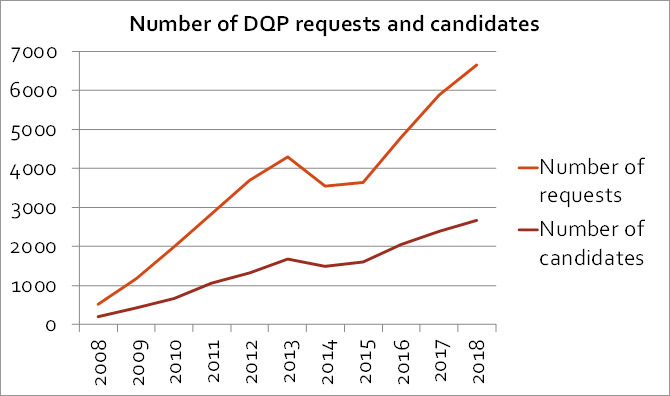 It's clear that DQPs are meeting the needs of many candidates in examinations, although we know that they don't suit everyone or all subjects. On that, CALL can come to meet with, for example, groups of local authority staff to discuss the use of technology as Assessment Arrangements for NO COST. This is typically a half hour to hour session - contact Paul (Paul.Nisbet@ed.ac.uk) if you would like to discuss this. If you need actual Professional Learning for your staff, we can provide it either face to face, or online - contact Shirley Lawson (Shirley.Lawson@ed.ac.uk) to find out more. Some of the slides and data we discussed during the day are available in this 2018 DQP Overview. At the Focus Group we did some polls using Mentimeter, and one of the topics was the type of machines used in the examination: Windows computers continue to be the most popular type of machines, by far. 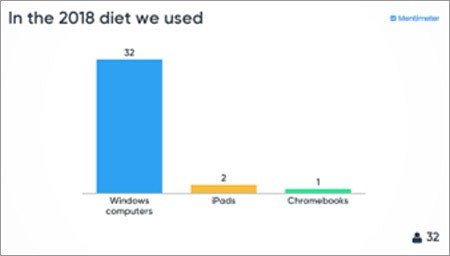 We have been exploring the use of Chromebooks in examinations, but it's turned out to be quite a bit more complicated than we expected to manage the accessibility needs alongside security, which may explain why they do not seem to be used much as yet. Candidates for whom assessment arrangements are provided should potentially have the ability to achieve the national standards, but be unable to do so using the published assessment procedures. The integrity of the qualification must be maintained. Assessment arrangements should be tailored to meet a candidate’s individual needs. Assessment arrangements should reflect, as far as possible, the candidate’s normal way of learning and producing work. I'll detail how spellcheck and computer voices for Modern Languages can be obtained in future blogs. In 2015 we ran the Talking in Exams project where 29 schools and services evaluated Dragon NaturallySpeaking and staff reported that, out of 39 students, use of Dragon in examinations was likely for 11 students; it was a possibility for 21 students (with more time, practice and support); and it was not likely for 5 students (no response for 2 students). However, the use of Dragon remains a minority sport at exam time - SQA only received 31 requests for use of speech recognition for the 2018 diet (out of 9,917 requests for the use of technology overall). There are probably several reasons for this - Dragon is excellent, but costs money; it requires installation on school computers; students need to learn how to use it, and how to dictate formal written English; etc. In the past few years, though, we have seen the free computer dictation offerings becoming more accurate and apparently more forgiving of legendary Scottish accents, and practitioners say that Google Voice Typing, Apple's Siri Dictation, and Microsoft Dictate are now starting to be used more often by learners in schools. The advantages of these tools are that they are free; available on student's mobile devices; and are very simple. They don't have all the features of Dragon - for example, you can't control the computer by voice in the way that you can with Dragon, but for searching the internet and for dictation, we think they are fine. However, given that the free systems all require access to the internet to work, there are security considerations for examinations which need to be investigated. Time for Talking in Exams 2? Digital Past Papers for the 2018 diet are now available (along with previous years from 2014) from the SQA web site, for practice and revision.